Early in 2013 when it started meeting in Cardiff as a group affiliated to Bristol IWW, the IWW in Wales counted less than 10 members. Later in the year, this had grown to two dozen, and on the 23rd November of that year it officially received its charter as a branch of the union – IWW Cymru was born! 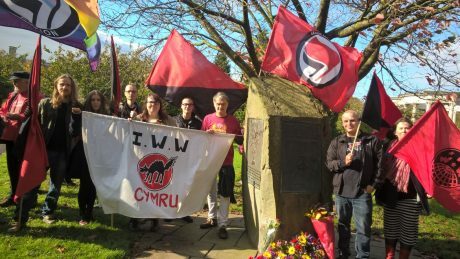 Fast-forwards five years and IWW Cymru is now competing to be the second largest branch in the union in the world, with members spread right across Wales and with active groups in Cardiff and Swansea. Cardiff in particular plays a significant role in the IWW across Wales, Ireland, Scotland and England, with a number of regional officer posts currently filled by members of the branch, alongside being a driving force behind major union campaigns including the IWW Couriers Network – itself starting in Cardiff in January of this year! Always Active and ready to fight! During the past 5 years, there have been a number of notable achievements by the branch. 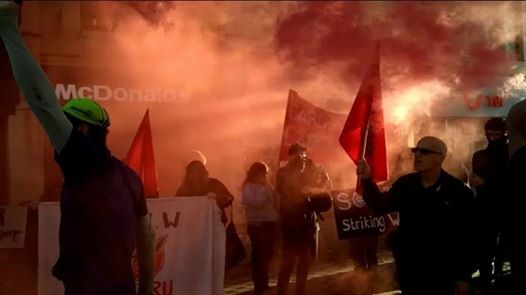 From representing our unemployed members through DWP procedures to supporting and helping to organise antifascist and prisoner solidarity actions and demos, conducting actions at Admiral in Cardiff in solidarity with Spanish employees of the company and organising simultaneous anti-workfare pickets in 8 towns and cities across Wales in 2015, IWW Cymru has been continually committed to supporting its members and the wider working class against the continual assault on its existence and dignity posed by government, big business and far-right groups. IWW Cymru has trained and supported its members to be able to represent and organise their fellow workers in their workplace making sure that they are armed with the knowledge they need to make a difference in our workplaces and communities – now boasting of 25 trained workplace representatives and 25 workplace organisers up and down the country! IWW Cymru reps over the past five years given work-related advice to countless members and provided them with representation at numerous disciplinaries and grievances – and have notably won substantial payouts for unfair dismissals! 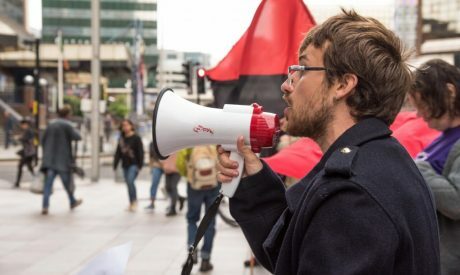 IWW Cymru is not only looking to defend the working class where it is attacked – it is also seeking to expand and bring forwards the next generation fighting for the future emancipation of the working class. Evidence of this can be seen in our outreach to students to inform them of their rights at work, the thriving IWW Students Society at Swansea University – the first of it’s kind in the UK! Looking to the future, the recent IWW All Wales Assembly which was held in Cardiff demonstrated the great health that the Welsh branch of the union finds itself in and provided a glimpse of the future as the IWW in Wales continues to grow and fight for a new world in the shell of the old! The union is only as strong as its members and the union is always looking for new people to get join and get involved in the fight – if you want to work to make a change head over to iww.org.uk/join and complete an application form today!